Alexei Taroutz is best known as a guitarist and master-mind behind instrumental avant-rock quartet I AM ABOVE ON THE LEFT. 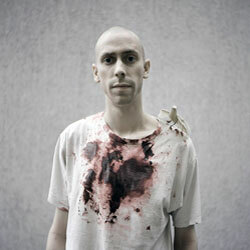 Since the end of 2006 when the four decided to cease their joint-venture, Taroutz has gained reputation as one of the most inventive and originally minded experimental composer scoring for cinema and making solo recordings. Ranging from micro-noise manipulations and ambient-drone sculpturing to academic minimalism and chamber-rock music, Taroutz’s solo works are always deeply rooted in documentary visual performance often self- cinematographed and directed. "Bound in a very nice packaging design (a special bound hardcover with relief printing and silvery applications on the back) comes an improvisational/structured album by a Russian avantgarde multi-instrumentalist Alexei Taroutz that convinces mainly by the courage and disregard with which it mixes and opposes all kinds of things. Noise expeditions ample side by side with loosely brushed post modern experimentalism, a tiny glockenspiel braves into the equation and some time after some electro-acoustic minimalism or minimalist electro-experimentalism takes place. In a way it is a complete mess, yet it is beautiful in the same way wandering through a deserted building site or a halfway developed and then forgotten agrarian field is beautiful. You can sense the movement of things falling apart but also there is the smell of something else, something new coming up. It is important to notice that the music of Taroutz, though distorted, abstract and far away from regular, even avantgard music, nevertheless never is obscure or weird. Sometimes it becomes outright harmoniously beautiful, especialy for instance during the end of 'Molfar', the third track on Morok, where an echoy guitar plays two- and three-string chord in minor key, with a definite blue feeling. That is somewhere after the trombone insert of Timur Shapirov has faded away. And even though there are tape-time-effects inserted, they don’t sound disturbing or destructive to the flow of the music. Even if the track ends in a tape-wind-dynamic, it is a nice and easy thing to listen to. If you let it, that is. Openness is a must. The music in itself is open. When he strikes guitar chords in sync with drums beaten during the fifth track, 'Omut', the feeling is of an even extremer Codeine (and no singing). Maybe the reason for this mellowness is that the album was constructed and recorded from autumn and winter, a season that is usually connected to melancholia, decay and introspection. 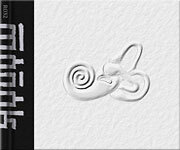 And maybe that is why the relief print on the cover of the album depicts the anatomy of the inner part of the human ear, which points to the fact that listening aka the decoding of soundwaves into audible signals and data is a very complex process in the human head, ie. inner ear and brain. Both play an important part in the decoding of the data and there are many effects and sideeffects that may change the decoding of that data. And it also is a call to the listener to become just this, a listener. One that meditates on his own sensory shortcomings and tries to insulate the proper meaning of the music in front of him. It is obvious that Taroutz wants more with his music than just have people to listen to it. He wants them to react, maybe even if it is only a meditation. Because if there is one common denominator to most of the tracks on Morok it is their trancelike or better trance inducing appeal. If you listen deeply you fall into them and may never get out. On the other hand a couple of vocal samples definitely set you out of any mode you have settled in. So no comfortable relaxing, even if it is most welcome. Summing up, a lot of maybe’s, a lot of contradictions and a lot of questions. Great effort." – by Georg Gartlgruber of Monochrom-Cracked (Austria) (July 2008). "From noise-filled audio space to amorphous and abstract sounds and avant-garde arrangements, a few rock references to electro-acoustic manifestations, there is a plethora of aural assaults on your brain... It is minimalistic, focusing on saying as much as possible with as little as possible. It is also mostly slowly moving, allowing the listener to take in and absorb the sounds produced... When listening to this do not look for a thread or theme to follow in each track; do not to try and enforce an idea on the music. Try simply to let go and flow with the sounds as they come. With that might begin the enjoyment of listening to this album and perhaps understanding it better." – by Assaf Vestin of Sonic Frontiers (USA) (July 2008). "While Morok definitely won't appeal to the masses, patient listeners and fans of minimalist, avant-garde music will find this to be an enriching and rewarding listening experience from beginning to end. (Score: 3,5/5)" – by Ryan Sparks of Sea Of Tranquility (USA) (September). The album was also reviewed at: Rate Your Music (USA), MADZ-zine (Russia), The Silent Ballet (USA).